tations. Australia's small desert dasyurids are remarkable in their ability to move very long distances in response to local rainfall and fire events, thereby utilizing different vegetative growth stages and short-term flushes in food availability. Planigales live in deep soil cracks and have a suitably flattened body shape. Arboreal and scansorial (above-ground) species, including the antechinuses, are more likely to have a well-developed and dexterous clawless hallux on the inside of the hind foot, which assists with grasping branches or rocks. Very capable climbers such as spotted-tailed quolls (Dasyurus mac-ulatus), also possess fleshy ridges on their foot pads and sharp claws. 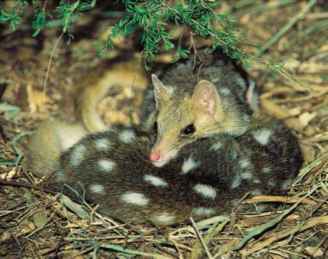 Spotted-tailed quolls can climb large, straight trees to kill possum prey in their daytime tree-hollow refuges, move from tree to tree through the canopy, and climb head-first down trees. Dasyurids live at extremes of temperature, have a low basal metabolic rate like other marsupials, experience a fluctuating food supply, and most species are small and so lose and gain heat easily. Carnivorous marsupials cannot sweat but resort to licking, panting, and lying flat out on the substrate to keep cool. Strategies to conserve body heat and reduce energy expenditure are diverse. Surface-dwelling desert species such as ningaui have a spherical body shape, which maximises heat conservation. Antechinuses and Tasmanian devils increase fur thickness in winter and the fur color of some species (fat-tailed dunnart, Sminthopsis crassicaudata) becomes darker towards temperate regions. Most dasyurids use protected locations in hollow logs and trees, underground burrows, soil crevices, caves, and tussock grasses to rest during the day or between foraging bouts. Many species line their nest with insulative dead vegetation which they harvest and carry in their mouth, and some huddle in groups comprising adults, or mother and offspring. Huddling in communal nests reduces energy expenditure in dunnarts by 20%. Torpor, in which the body temperature is voluntarily reduced to between 52-82oF (11-28oC) for periods of several hours, is used by half of dasyurids and the numbat, species ranging from 0.17 oz (5 g) to 35 oz (1,000 g) in body size. Torpor is employed as a daily or occasional strategy to conserve energy while resting, under the stresses of cold or food restriction. The females of some species even go into torpor when with young. The slow marsupial development rate may allow this without adverse effects on the babies. Perhaps as a consequence of their relatively low basal metabolic rate, common to all marsupials, carnivorous marsupials have a pronounced ability to increase metabolic rate when cold that exceeds that of some placental mammals. 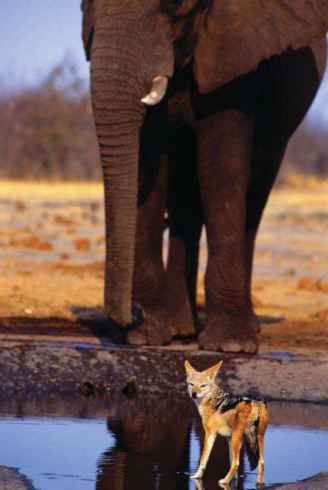 Another interesting question to ask is what determines how species live together. As most carnivorous marsupials are generalised predators that can take a wide size range of invertebrate and vertebrate prey, structurally complex habitats that offer a variety of different places to forage are an important contributor to local species diversity. Rather counter-intuitively, it is the arid zone habitats, as well as forest and heath, that are more structurally complex and offer the most opportunities for multiple species to partition resources. This may explain why there are so many species of desert dasyurids. Although the scansorial or above-ground foraging niche, that is important in forest, is lacking in deserts, a wealth of opportunities to segregate are provided by cracks in clay soils, sandy, sand dune and rocky substrates, and structurally complex vegetation such as hummock grasslands. In forests, the arboreal or above-ground foraging niche contributes to species coexistence. A number of antechinuses are scansorial, meaning that they scramble around both on the ground and a number of metres up into shrubs and trees, even denning in tree hollows. 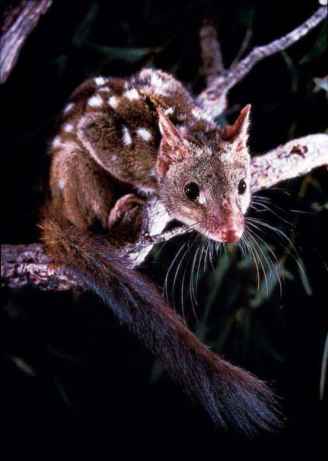 Among the larger marsupial carnivores of Tasmania, spotted-tailed quolls separate from their close competitors, eastern quolls (Dasyurus viverrinus) and devils (Sarcophilus laniarus), on their greater arboreal use of habitat.